Sushi fans can find their heaven on earth at Tokyo's gigantic Tsukiji Fish Market. Here, at the world's largest market place for all kinds of products harvested from the ocean, you'll find all in one place – wholesalers, exporters, importers, local food retailers. And, of course, fresh sushi. TSUKIJI FISH MARKET, TOKYO — It is just after five o’clock in the morning and the sun hasn’t yet risen over Tokyo. Streets and avenues that are bustling with life and traffic congestion during daytime, still lay empty but for a taxi or two, garbage workers and a newspaper boy doing his daily delivery round. But down at the river, a group of tourists wanders around, seemingly lost after having exited the nearby Tsukijishijo subway station. Then a large, waterfront terminal-like building materializes itself out of the darkness and the group starts to walk warily towards it. This is the colossal Tsukiji Fish Market, where tourists are if not welcomed so at least somewhat accepted. The size of the facility is massive, built in a huge 90 degree bend and ingeniously devided into sections with specific purposes. Exchange, depository, sorting departments, freezing warehouses, logistics, shops, kitchen and restaurants all fit under the same roof. And inside the huge building, work has been going on for hours already. We wander closer to the heart of the place, the wholesale market place where the famous tuna auction is in full swing. 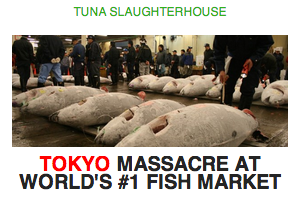 Large, rinsed and frozen tunas lay in rows with bidders carefully inspecting the dead animals before placing a bid. The tuna auction usually starts at 05.30 AM, after the fishing fleet has unloaded its catch at a jetty alongside of the Tsukiji building. But this is an international market place, and tunas arrive by flights too and are brought to the market by trucks, where the products are given a price, whereafter they are brought back the same way. Through a maze of stalls where sellers market eel, octopus, clams, spawn of fish, bentos, and men carry out filleting, rinsing, sorting and take a cigarrette while reading today’s paper, small three-wheeled cargo trucks run around at blazing speed. Behind the stalls is the actual auction, where prices are yelled out with a monotone Japanese tone. Buyers wander around, looking concentrated and professionally skeptic, carrying a flashlight and a stick by which they inspect the frozen tunas. Had it not been for the motorized electric trucks and modern fluorescent lighting, it would have been hard to decide what century we are in. This is what a fish market always must have looked like, I reflect as I make my way over to the restaurant section of the market. Prices are high here, but fresh sushi is considered a must while visiting this place. A plate of 13 pieces, served on a big green leaf, comes at about 22-23 euros in one of the restaurants at the time of visit. But it is possible to cut prices by about half if you exit the market area end hit any of the many sushi places in the close vicinity of Tsukiji. Tsukiji is located just south of the Ginza shopping district in cental Tokyo. To get there, take the Oedo line to Tsukiji-Shijo (Tsukijishijo) station, exit A1. From the street Shin-Ohashi Dori, walk southeast towards the river a couple of hundred meters. Alternatively, you can also take the Hibiya subway line of the Tokyo Metro to Tsukiji station. • The market’s most busy hours are between 5 and 8 AM, so you’ll need to get up early to catch the essense of Tsukiji. • Remember that this is a place of work and not primarily a tourist attraction. You are asked not to use camera flash inside the market. Beware of the electric trucks that run all over the place, as they come in high speed around corners. • Accoring to some reports from other travelers, the market is closed for visitors from December through mid-January, as it is Tsukiji’s most hectic period. Check the status ahead of your visit. • Founded in 1935, the market, whish also handles vegetables, fruits and related agriculturals, processes about 2,000 tonnes of products every day.